Many people dislike camping simply because they dread the sleeping arrangements and what they must rest upon after a long day. Even though you have many important items to pack when doing out, your sleeping arrangements are important. 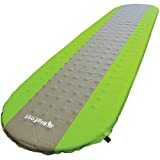 A proper sleeping pad is all you need to make any rough terrain feel like a cloud or your bed at home. You want maximum support, while you insulate your body from any hard projections on the ground. We identified the top 10 best sleeping pad to make sure your next trip is restful. The Klymit is ideal for backpackers and hikers who want a light load while still enjoying a restful night.it has a body-mapped V shape to hug your body during sleep. It is incredibly stable while it also has side rails. The Premium self-inflating is durable and suitable for men weighing over 230 pounds without damaging the bed or finding themselves on the ground in the morning. It takes the contours of your body without deflating. Unroll it, give two or three blows and you are set for rest. The Tri-Fold s convenient for camping, traveling, kids and unexpected guests. 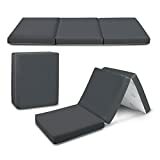 It is portable and lightweight and folds to a convenient carrying size making it easy to move around. While it will not fit into a back-pack can you take it along in your vehicle for camping trips, use it at home or gym. The honeycomb design of the Ecotek with Flexcell is the perfect pad to line hammock and sleeping bags. It is ultra-light and folds up to a convenient small size to fit into a backpack. The extra-thick sleeping pad from IFor-Rest is made from durable 190T polyester and suitable for all conditions. 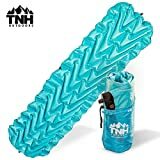 Its innovative design ensures that you are comfortable without the need to carry a pillow or two with you when hiking or camping. 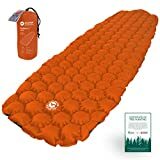 Bigfoot Outdoor is known for its high-quality camping gear and they did not go wrong with their new self-inflating sleeping pad either. All you need to do is take it out of its protective carry bag and unscrew the valve to allow it to self-inflate. If you want a firmer mattress just add a fewmore puffs. A major plus point in its favor is the USA-made GreenTEC USA label it carries with the manufacturer a trusted brand. It is versatile and can be used in various application like a hammock, in a tent, on a cot or as envelope style sleeping bag. 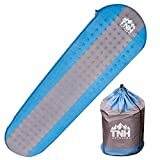 You cannot wake up grumpy when you have this high-quality sleeping pad from TNH. Durability and strength guaranteed with the 75D polyester shell with extra-strong valves for easy inflation. Uneven surfaces are not a problem when you camp either and your camping adventure can reach immeasurable heights with a good night’s rest. Since sleep is important regardless of your activities, you want to have a sleeping pad that is durable, comfortable and lightweight. These pads have all the best qualities like insulation, all weather and all-terrain with sizes to make an informed decision. 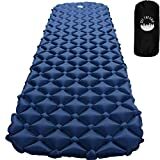 Our top 10 best sleeping pad reviews in 2019 should make it easier for you to pick your sleeping pad for your next hiking or camping trip.